Preheat oven to 150°C (300° F). To make the dressing, defrost 1/2 cup wild blueberries. Mix with 5 tbsp oil, sugar, scant 1/4 cup vinegar and lemon juice. Season with salt and pepper. Set aside. In a small pan, toast the sunflower seeds without oil, stirring as they roast. Remove from pan and cool. 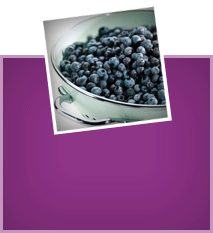 In a small pot, combine the remaining vinegar, 1 cup wild blueberries, mustard and maple syrup. Simmer on low heat for approx. 10 minutes. In the meantime, wash chicken and pat dry. Season with salt and pepper. Heat 2 tbsp oil in a pan. Sauté the meat at high heat for around 5 minutes, stirring as it cooks. 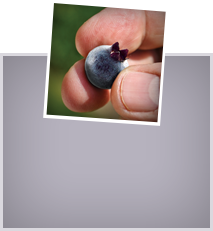 Pour the wild blueberry mixture on top and bake for around 10 minutes in the oven until done. In the meantime, wash lettuce and spin dry. Slice into bite-size pieces. Wash and slice tomatoes, peppers and cucumbers. Cut the avocado lengthwise, remove the skin and pit and slice into thin pieces. Remove the chicken from the oven and slice. Toss the salad with some of the dressing and transfer to deep serving bowls. 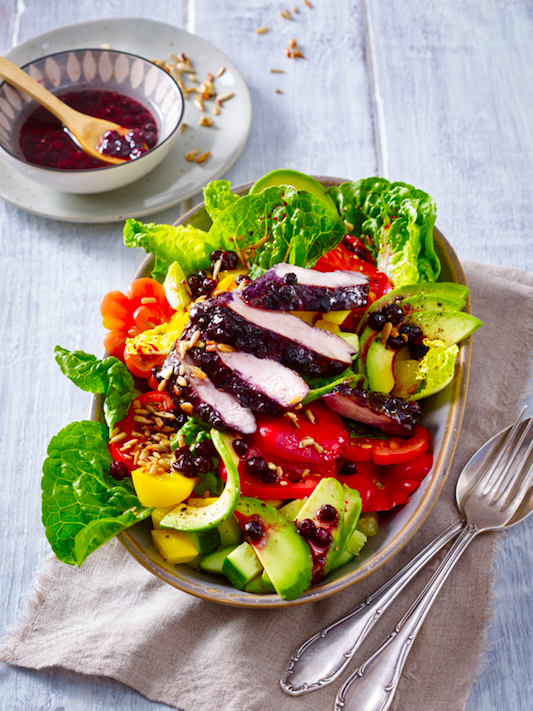 Arrange the chicken and sunflower seeds on top of the salad. Serve with the rest of the dressing on the side.